The provinces of Sri Lanka, (Northern, Central, Eastern, Western, North Central, North Western, Uva, Sabaragamuwa and Southern) are not ‘historical’ provinces set out by the Sinhala kings. They are not ‘natural’ provinces formed through migration and settlement either. These provinces are ‘new’ provinces imposed on the island by the British rulers in the 19th century. So it is not necessary to worship them. On the recommendation of the Colebrook-Cameron Commission of 1832, the British rulers created five large provinces, labelled North, South, East, West and Central in 1833. The Northern Province consisted of the districts of Jaffna, Mannar, Vanni and Nuwarakalaviya. Southern Province consisted of the districts of Galle, Hambantota, Matara, Tangalle, Lower Uva, Sabaragamuwa and Wellassa. Eastern Province was composed of the districts of Trincomalee, Batticaloa, Bintenna and Tamankaduwa. Western Province contained Colombo, Chilaw, Puttalam, Lower Bulatgama, Tun korale, Satara korale, and Sat korale. Central Province contained the districts in the central highlands. The traditional administrative units of disawani and korale were absorbed into these five provinces. Starting from 1845, four new provinces were added to the list. The ‘North Western Province’ was created in 1845. It contains today the Kurunegala and Puttalam districts. The ‘North Central Province’ was created in 1873. It comprises today of Anuradhapura and Polonnaruwa districts. ‘Uva Province’ was created in 1886 and ‘Sabaragamuwa Province’ in 1889. This completed the creation of the nine provinces which we use today. These provinces acquired legal status in 1987, when the 13th Amendment to the Constitution of Sri Lanka established Provincial Councils. The provinces are highly irregular in shape, with curves and jagged edges. They look like jigsaw pieces. One expects provincial boundaries to have straight or near straight boundaries. The boundaries have not taken geography and contour into consideration either. You move from Central province to Sabaragamuwa province in the middle of Kadugannawa pass. The provinces are grossly unequal in size too. North Central Province had the greatest land area of 10,472 sq km , followed by Eastern Province with 9.996 sq km, Northern Province 8884 sq km, Uva Province 8500 sq km , North western Province 7888 sq km, Southern province 5544 sq km, Sabaragamuwa Province 4968 sq km, Western province 3684 sq km and last of all, Central province with 2.191 sq km (2012 Census). Population is also distributed unequally within the provinces. The data is given here is ranked according to population density, starting with the lowest. Northern Province has a land area of 8884 sq km, population of 106,1315 and population density of 128. North Central Province has a land area of 10,472 sq km, population of 126,6663 and population density of 130. Uva Province has a land area of 8500 sq km, population of 126,6463 and a population density of 152. Eastern Province has a land area of 9,996 sq km, population of 155, 5510 and a population density of 166. North western Province has a land area of 7888 sq km, population of 238,0861 and a population density of 317. Sabaragamuwa Province has a land area of 4968 sq km population of 192, 8655 and a population density of 392. Southern Province has a land area of 5544 sq km population of 247,7285 and population density of 460. Central Province has a land area of 2.191 sq km population of 257,1557 and a population density of 461. Western Province has a land area of 3684 sq km, population of 585, 1130 and population density of 1628. The total land area of the island is 65,610 square kilometres and its total population is 20,359,438. (2012 Census). The British administration embarked on a Census of population in 1871. This census did not stop at enumerating the population. The census enumerators fell on the districts, calculated the racial percentages in each district, found a majority race for each, and then classed the districts as Tamil, Sinhala or Muslim districts. 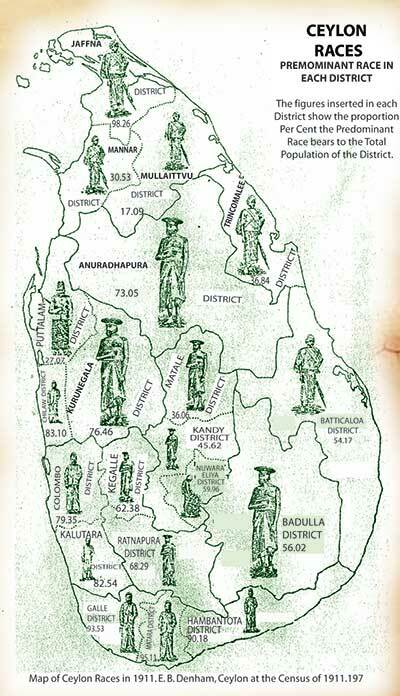 Census of 1891 provided three separate maps of Ceylon, giving the majority districts of the three communities. The districts of Mannar, Jaffna, Vanni, Trincomalee and Batticaloa were assigned in bright pink to the Tamils, making the Tamils the majority community in both North and East. The Eastern Province had a flourishing Sinhala population before the British took over. The British deprived the Sinhala villages of water by not repairing their tanks and the Sinhala villagers starved and died. Tamil immigrants then came in, on the invitation of the British. The British settled them by the shore where they are today, together with Muslim villages. Sinhala villages which came up later are found far inland. The British saw the value of the eastern side of Sri Lanka, sliced off the full length of the east coast and made it into a separate Eastern province. The Eastern Province is the longest province. It starts below Kokilai and ends at Yala. It includes, in a single administrative sweep, the magnificent Trincomalee harbour and the full shoreline facing the Bay of Bengal. On the opposite side are Burma, Thailand and the Kra canal. The Bay of Bengal is going to be a vital region in Indian Ocean politics and that is why powerful countries are wooing Sri Lanka. Most Sri Lankans, however, are unaware of this. They have been carefully fed the notion that the East Coast is best used as a playground, for surfing, beaches and whale watching. The media emphasis has always been on these features. It is very cruel and despotic of this mad government to detain two extremely patriotic citizens of Sri Lanka, Udaya Gammanpila and Mohammed Muzammil. These two Sri Lankan patriots always stood for a unitary state and are the biggest opponents of the separatists and the federalists and the like. This is why they are detained today. It is particularly harrowing that during this Ramazan period Mohammed Muzammil is detained since he then cannot fast even. The only crime these two extremely patriotic citizens have committed is standing up against any kind of partition of their motherland which all patriotic citizens should do on behalf of future generations. Both these patriotic citizens have two small children each and it must be particularly harrowing for them to go through such a harrowing experience. Let us commence a petition to release these two patriotic citizens as soon as possible. Mad Sirisena and Ranil should apologize to Udaya Gammanpila and Mohammel Muzammil for detaining these two patriotic citizens for no reason whatsoever like this. This entry was posted on Tuesday, June 21st, 2016. You can follow any responses to this entry through the RSS 2.0 feed. You can skip to the end and leave a response.